Specially designed for Wii boxing games. Inspires and motivates you when wearing this boxing gloves to play the game. Fully compatible with playing Wii boxing game. Makes the game more realistic and exciting. 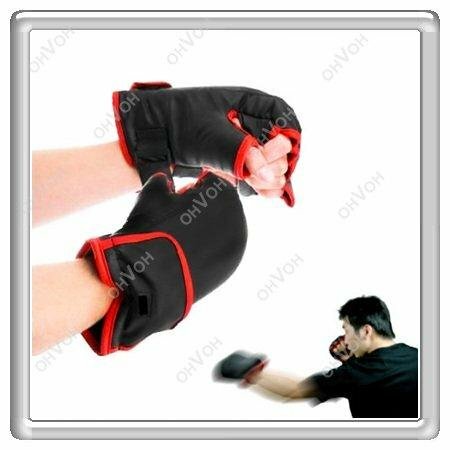 The boxing gloves will ease your hands' tiredness. Double the joy of playing the game. Made of special material, comforatable and durable. 1. Small quantity, delivery by express, such as DHL, FEDEX, UPS, TNT, EMS etc. it will takes 5 to 7 days from China to your country. If via China Post Air Mail or Hongkong Post Air Mail, it will takes 7~20days. 2. Medium quantity, delivery by air, it will takes 7 days from China to your country. 3. Large quantity, delivery by sea is also acceptable, it will take 30 working days. Escrow, a leading third-party online payment platform from the Alibaba Group. Place of Origin: Guangdong China (Mainland)|Brand Name: bst|Package: Yes|Model Number: s5m|Boxing Glove: for Wii Remote and Nunchuk|Specially designed: for Wii boxing games|Fully compatible: for playing Wii boxing game.|Makes the: game more realistic and exciting.|Made of special material,: comforatable and durable.